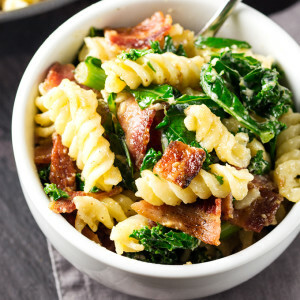 My Cheesy Pasta with Bacon and Kale is a super speedy dinner for those busy weeknights! I’ve been making various versions of this Cheesy Pasta with Bacon and Kale cheesy since I was at high school. Back then it usually consisted of pasta, cheese, cream, bacon and sausage. Sounds pretty unhealthy, but it was so good, I even used to take it in cold for my packed lunch if I could get away with it. This version actually isn’t that far removed, although I refuse to serve up dinner nowadays without at least one serving of veg. So for this version I’ve swapped out the sausage for a huge pile of kale. 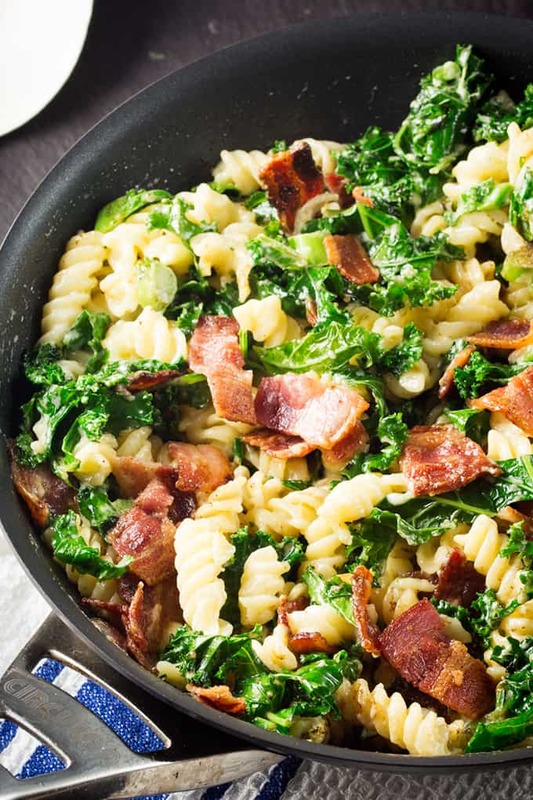 Don’t despair though, even if you are in dire need of some devilish creamy, carb-iness, and the green-ness of this meal is putting you off, I should tell you that the kale is wilted in bacon fat before being stirred into the pasta. ‘Two steps forward, one step back’ springs to mind….. If that’s going just a little too far for you, then simply add the kale to the pasta for the last minute of cooking. If you get that kettle on to boil as soon as you walk in the kitchen, you can be eating this for dinner in 15 minutes. I’ve still got a finger full of blue stitches, but they’re finally coming out on Wednesday! I ended up taking the bandage off after a week. The hospital had initially told me to keep it on until the stitches came out, but come on! It’s me we’re talking about. Despite trying to keep it clean, I had that thing covered in cake mix and ketchup within a week. 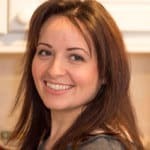 It means I’ve been able to get back in the kitchen a little more whilst wearing gloves, but I can’t wait to get back in there properly and have my hands squishing through bread dough and rolling meatballs again! In the meantime, fast, naughty, carby, bacon-filled dinners will just have to keep me going (sigh). 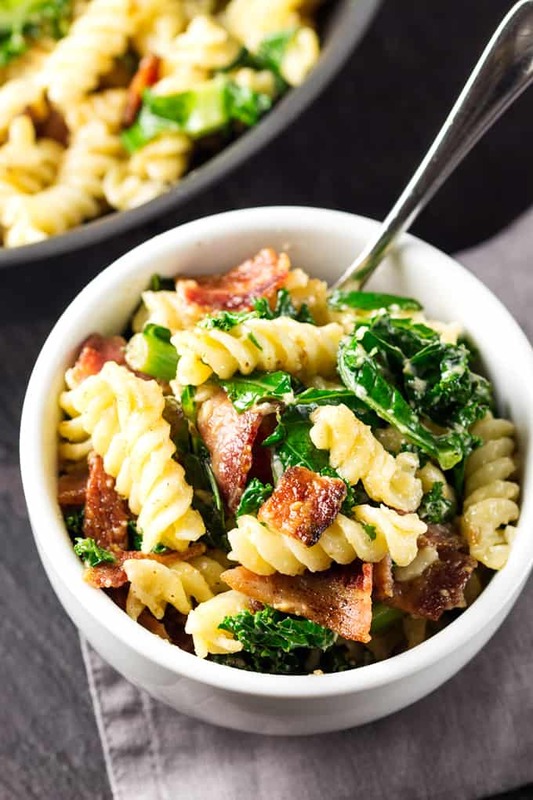 Cheesy Pasta with Bacon and Kale - ready in 15 minutes! Bring a large pan of water to the boil and cook the pasta according to the pack instructions (usually 10-12 minutes). 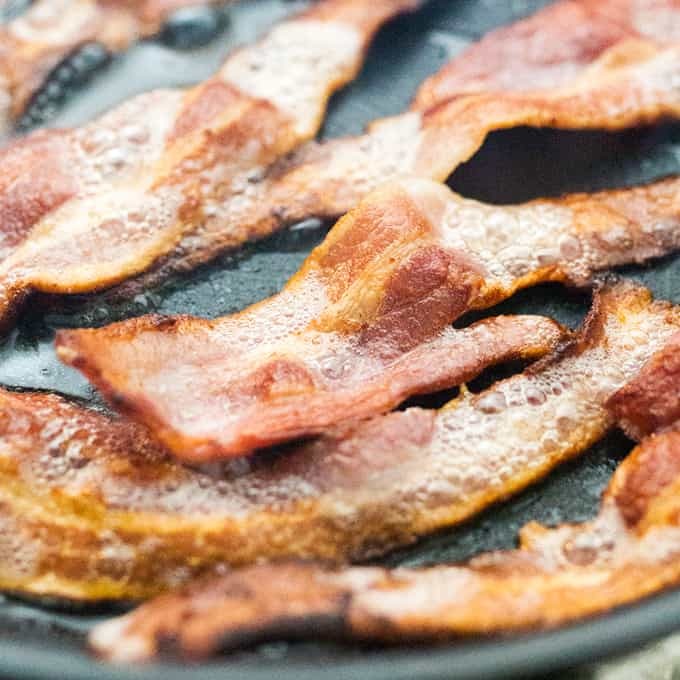 Whilst the pasta is cooking, heat the oil in a frying pan until very hot, then cook the bacon until browned and crispy (about 5 minutes). Turn a couple of times during cooking. Remove from pan and chop into small pieces. Keep the frying pan on the heat, but turn the heat down to low (there should still be some bacon fat in there). Place the kale in the bacon pan and let it cook in the hot oil for 1 minute. Turn off the heat. When the pasta is cooked, drain it, reserving 1 cup of the cooking water. Put the pasta back in the pan and place over a low heat. 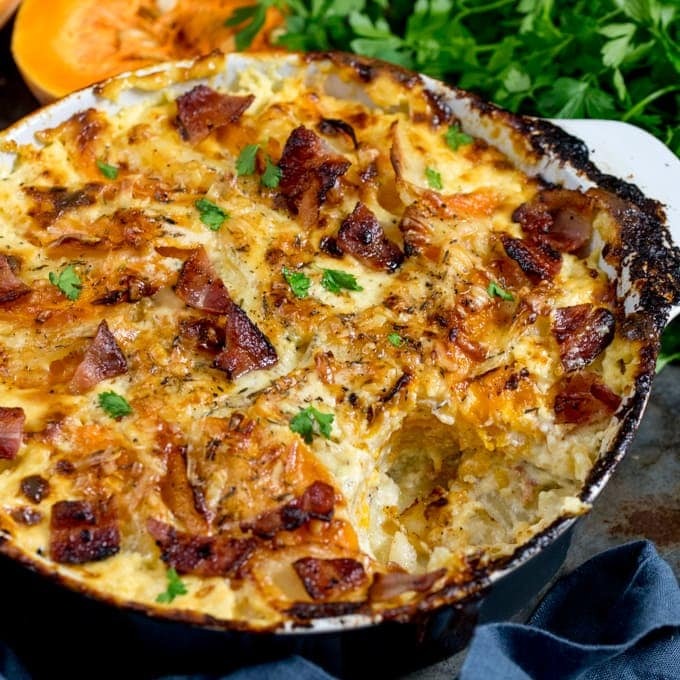 Stir in the cheese and cream, then once the cheese has melted, stir in the kale and bacon. Heat through for 1 minute. If the pasta looks a little dry, add in a good splash of the pasta cooking water. Divide between four bowls and serve. 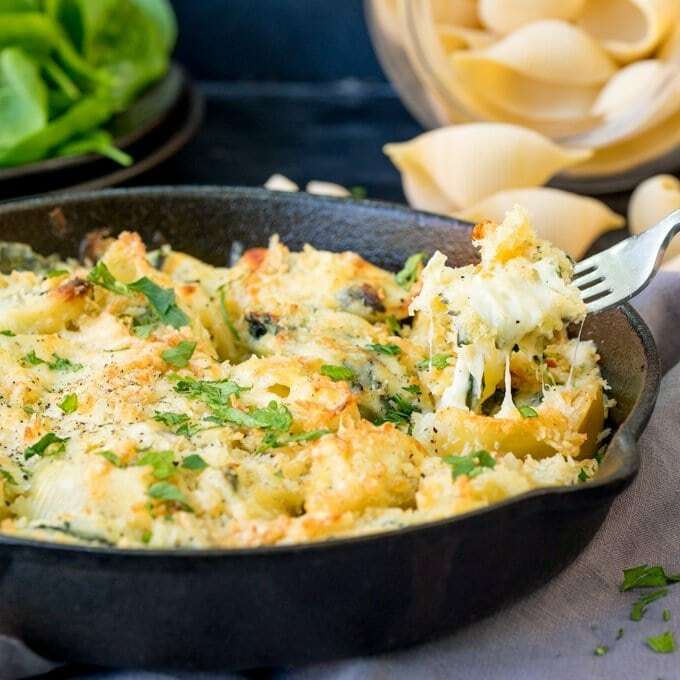 Tea sorted, this looks delicious and quick. 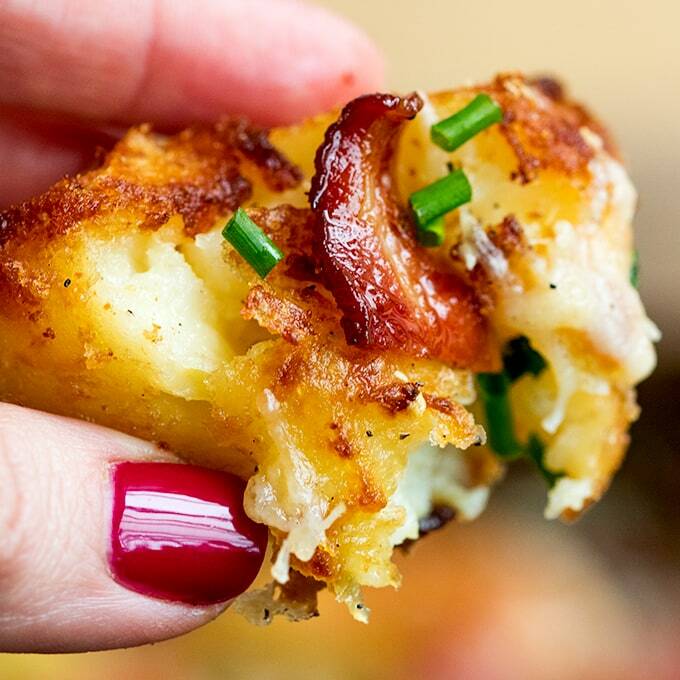 Perfect for midweek dinner after work. Sounds good! What kind of cheese did you use? Doh, can’t believe I missed that out. I’ve updated the recipe now, thanks Laurie. I used a sharp cheddar cheese. I’m happy to hear your hand is doing better. Scaring kids with Frankenstein hands, now that’s hilarious. 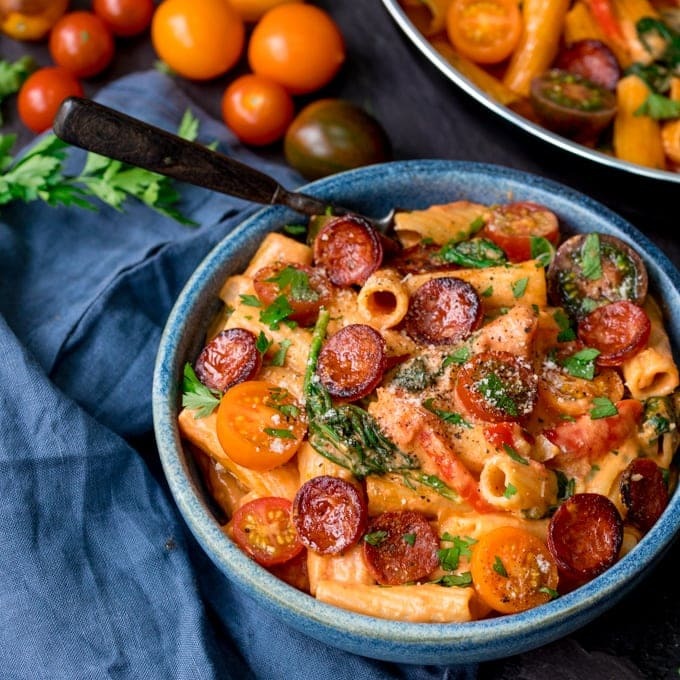 And this pasta dish looks awesome. I love anything with bacon in it.